Coaching refers to guiding and helping a person to achieve future goals. Many situations in life arise where additional support and insight are needed to move toward personal goals or to push a person to a higher level of performance; the coaching profession is built on addressing these needs. Though coaches often receive professional training through various programs and institutions, they are not licensed as therapists, counselors, or mental health professionals. Personal and life coaches offer a wide range of services that are customizable to meet a person’s goals. Life coaching can vary greatly from one coach to another, and one person's experience with a life coach might be very different from another person's experience with the same coach. Coaching focuses on achieving specific goals such as graduating college, transitioning to a new stage in life, developing one’s business and leadership skills, becoming healthier, or losing weight. For example, if a person is wanting to embark on a new business venture or career path but needs guidance in determining where to start, he or she may reach out to a business or career coach. Personal coaches may also address spirituality issues, such as wanting to explore new ways of connecting with the metaphysical experience of life. Life coaches tend to take a more proactive role than therapists. They may meet with people in their homes, have frequent phone calls, and give direct instructions to their clients. They can't diagnose psychiatric conditions, which means life coaching may not be the best option for someone struggling with a mental health condition. Life coaches tend to focus on specific issues, while therapists take a more holistic approach. People who goes into therapy for relationship problems might end up working on self-esteem, or their relationships with their parents, while a life coach generally sticks to the issues the person seeking coaching wants to work on. 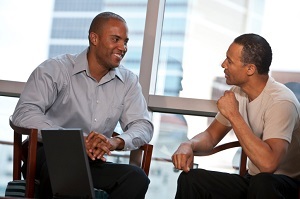 Typically, a coach will work with a person on specific goals, whether career-related or personal. Coaching sessions may be conducted in person, or they may be carried out in a manner similar to distance therapy, in which sessions occur via the phone or Internet. Many coaches employ techniques associated with Neuro-Linguistic Programming (NLP), which examines how our interpretations of the world influence or control our day-to-day thoughts, inclinations, and behaviors. Productive thoughts, behaviors, and skills are strengthened through NLP in order to promote positive personal change, and those that are unproductive are examined with the goal of replacing them. Therapists have to meet strict educational and licensing requirements to practice, but life coaches do not currently have such restrictions. Some state and national organizations, however, establish requirements for life coaches to become members. Some life coaches specialize in specific issues, and some life coaches are also psychotherapists who integrate elements of life coaching and therapy into their practices. Life coaches generally strive to have a positive, upbeat disposition and to encourage the same in their clients. Anyone can call themselves a life coach, but some “life coaching” schools offer certification and training in a broad array of issues and coaching techniques. A life coach may work with a coaching organization or work independently, and some medical or therapeutic practices partner with life coaches to help people work on specific goals. Mental health professionals may also offer life coaching skills, either as an add-on to therapy or as part of the therapeutic process. Concerns that have been raised with regard to coaching are mainly associated with licensing. Coaches often receive extensive training, education, and credentials, but they are not licensed mental health professionals. Regardless, some people may still reach out to a coach instead of a licensed therapist in a time of crisis or to deal with a mental health condition. In such cases, the hope is that the coach would then refer those people to licensed professionals who are experienced in handling these issues. In light of these and other concerns, those who believe in coaching as a profession are working to establish firm guidelines and practices. The International Coach Federation (ICF) is one group that actively advocates for the practice and ethics of professional coaching. By establishing core competencies and an internationally recognized system of credentialing for coaches worldwide, they have become a leader in the profession. To encourage ongoing education and enhancement, ICF’s members earn continuing coach education units (CCEUs) by attending a variety of programs and events to maintain their status as credentialed coaches. ICF also provides links to credentialed resources for professional coaches, such as The Center for Executive Coaching, where executives in a number of fields, including mental health, can find training and educational materials for how to add coaching to their list of skills and specialties. Coaching is sometimes believed to have emerged in the 1970s, primarily in the United States, when a wave of self-help and motivational materials swept through the nation. However, its proponents stress the fact that coaching is rooted in principles of self-improvement and modern psychology, and that life coaching as a term and a profession did not become widespread until the 1980s. Sports team coaches are believed to have been the first to utilize the approaches that have since been adapted for business, personal, and life coaching. Timothy Gallwey, an American writer, is credited with having identified the self-improvement potential of sports coaching in his book The Inner Game of Tennis, published in 1975. In it, he explored the personal blocks to physical success on the tennis court, and in subsequent years, sports coaches were encouraged to take their players’ psychological well-being into consideration when addressing their performance on the field. From there, coaching expanded into the workplace and the home as people realized that most anyone stands to benefit from a little structured guidance in working toward goals and achievements.